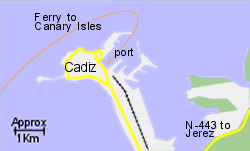 Map of the Cadiz Ferry Port area. The port of Cadiz is southern Spain's main port on the Atlantic and the bay has sheltered ships for at least the last 3000 years. 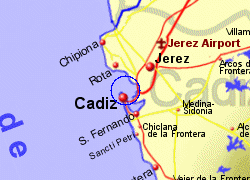 The city of Cadiz sits on the promontory that shelters the bay, with the port near the end. 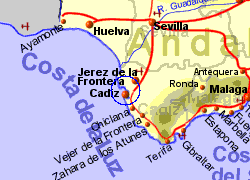 During the 16th to 18th centuries, this was Spain's wealtheast port, due to it's access to the Spanish Empire. 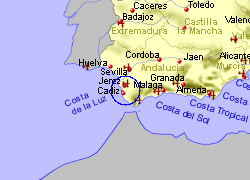 Being on the Atlantic side of the Straights of Gibraltar, Cadiz is a logical port for ferries to the Canary Isles. The train station is virtually next to the port and has fast Altaria trains running to Sevilla ans Madrid. Due to the lack of space in this city on a promontory, the roads leading in can become congested. Operated by Acciona with 1 crossing per week, crossing time 40 hrs. Operated by Acciona with 1 crossing per week, crossing time 31 hrs. Operated by Acciona with 1 crossing per week, crossing time 49 hrs. Operated by Acciona with 1 crossing per week, crossing time 64 hrs.